Replacing the background of a photo can be useful at times if you want to superimpose the subject into a different setting, create a transparency, and so on. In fact it can be extremely helpful if you’ve snapped a photo where the subject looks great, but the background leaves a lot to be desired. Although it might sound fairly complicated to remove and replace the background of a photo, with Movavi Photo Editor it isn’t anywhere near as difficult as you imagine. To be honest even if you have absolutely no experience editing photos, you should be able to change background in a photo in a matter of minutes. To get started, launch Movavi Photo Editor and click on the ‘Browse for Images’ button located right in the middle of the main window. If you prefer you could drag and drop the photo that you want to edit into that area as well, which will effectively add it to the editor. 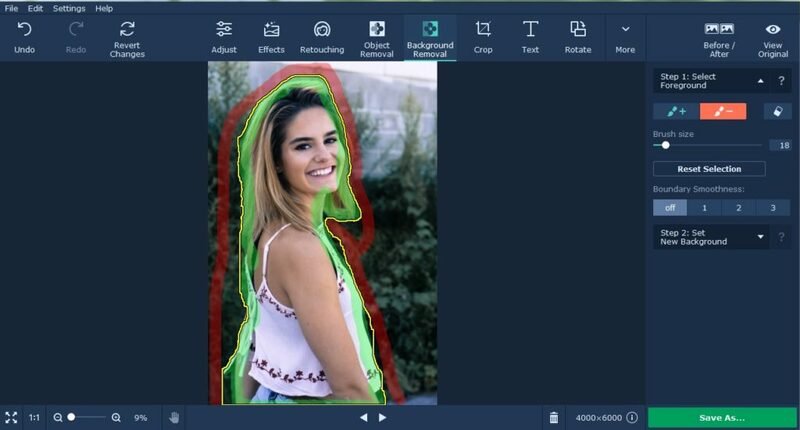 Once your photo has been added, select the ‘Background Removal’ tab in the upper part of Movavi Photo Editor’s interface. When you do a new set of tools will appear on the right side of the interface, and you can find and select the green ‘Foreground Brush’ and use it to mark out the objects in the foreground that you would like to keep. After that, select the red ‘Background Brush’ and mark out the background that you intend to remove. 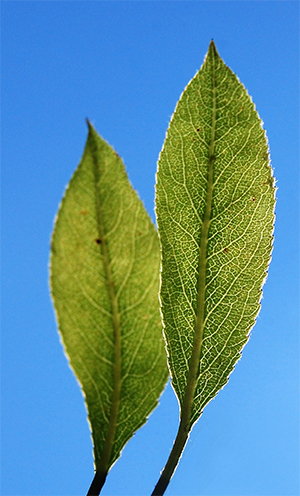 Based on the areas you marked, the objects in your photo should have a yellow outline around them. 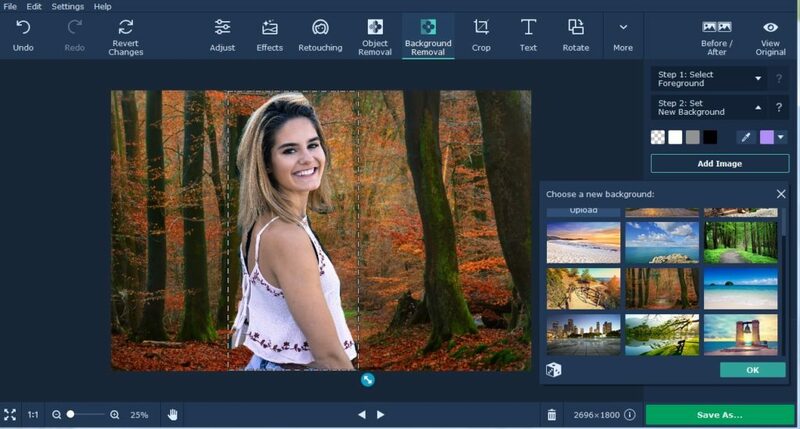 If you want you can alter your selection or clear it and start from scratch, but if you’re satisfied you can click the ‘Set New Background’ button to get Movavi Photo Editor to replace the background. At this point the background will be removed, and the objects in your photo will be set against a transparent background. Assuming you’d like to create a transparency you can save it, or click ‘Add Image’ then ‘Upload’ to select an image that you’d like to use as the background. In any case when you’re satisfied click ‘Apply’ then click ‘Save’ when you’re ready to save the alterations you’ve made using Movavi Photo Editor. Make no mistake before you save your video, you could edit it in a number of different ways using the features in Movavi Photo Editor. 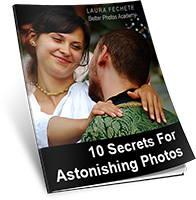 In fact it is highly recommended that you try them out so that you can enhance the photo quality, apply filters and effects, touch up portraits, remove unwanted objects, and much more. Because all the features in Movavi Photo Editor have a similarly simple and straightforward approach, you should have no trouble learning how they work by experimenting with them. 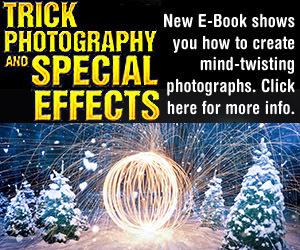 As you may be starting to realize its intuitive approach will allow you to edit your photos to a professional standard – without having to jump through any hoops or overcome a steep learning curve in order to do so.